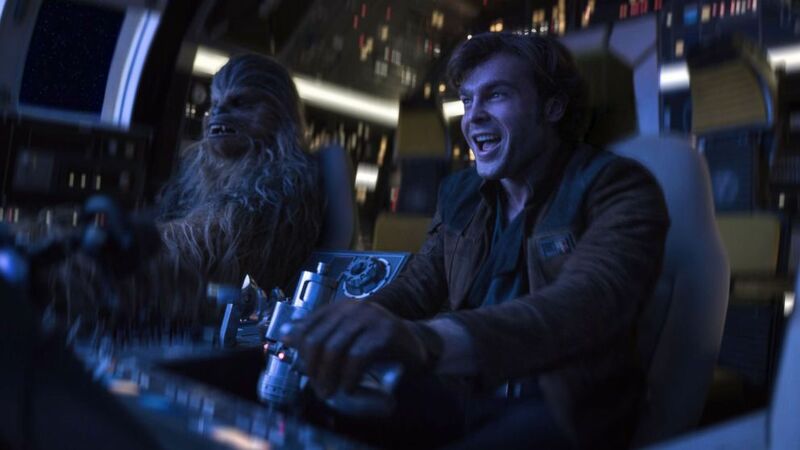 Four decades later, Alden Ehrenreich steps in to the Millennium Falcon cockpit. It’s a role that made Harrison Ford famous back in 1977. 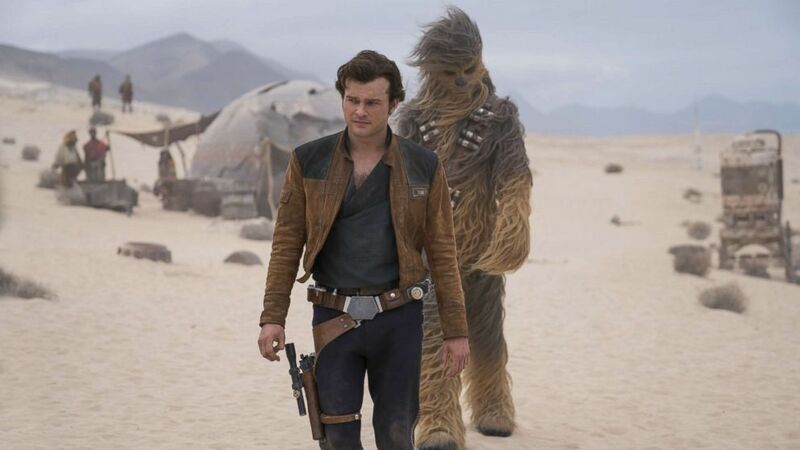 (Jonathan Olley/Lucasfilm Ltd.) Alden Ehrenreich is Han Solo and Joonas Suotamo is Chewbacca in "Solo: A Star Wars Story." The film follows Han as he looks for adventure and a lost love -- and finds his Wookie friend Chewbacca. But Ehrenreich says audiences might see a different side to the Han he plays. “I thought that every relationship, and every action scene, was meant to be a test of Han Solo, and a revealing opportunity for the audience to understand what’s making him tick, what’s going to shape him, into that iconic character that would recognize,” the movie’s director, Ron Howard, told Connelly. Donald Glover plays the younger version of the suavely appealing Lando Calrissian. Glover and Ehrenreich are part of a generation of actors who were first introduced to “Star Wars” films and merchandise by their family members. “I had everything, all the toys, a green lightsaber. When I went to do my screen test, on the Millennium Falcon, it was kind of like, ‘Oh, I’ve pretended I was on this before, so it felt kind of comfortable and cool,’” said Ehrenreich. In fact, Glover said his younger self wouldn’t believe that he’s currently starring in a “Star Wars” film. “There’s only one Lando, like, and then you find out that they were making more ‘Star Wars’ [films]. I told my agent, I was like, ‘If they’re making “Star Wars,” I want to be Lando,’” said Glover. (Lucasfilm Ltd.) Alden Ehrenreich is Han Solo, Donal Glover is Lando Calrissian and Phoebe Waller-Bridge is L3-37 in "Solo: A Star Wars Story," 2018. 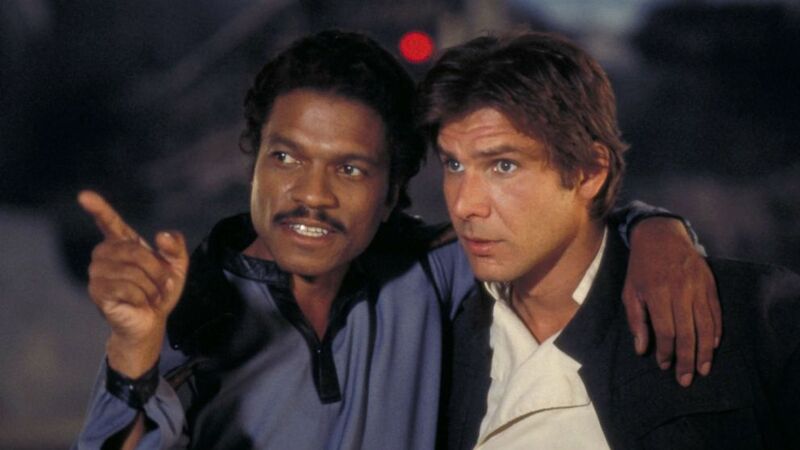 After being cast, they reached out to the originators of their roles, Harrison Ford and Billy Dee Williams. “Charming: that was like the one rule he told me. He was like, ‘Be charming.’ And I was like, ‘OK.’ I talked to him for a little bit. He texted me too,” said Glover of Williams. Midway through shooting last year, original directors Phil Lord and Christopher Miller – hailed for the irreverent comic tone they brought to such projects as “The Lego Batman Movies” – were ousted by Lucasfilm; a company statement cited “different creative vision.”. Ron Howard took the reins, with a mind toward making Solo a rite of passage for its hero. “I think the ‘Star Wars’ movies at their best, are full of not jokes, but humor, and that combination of values, I think allows audiences to be entertained in different ways,” he said. Howard said Ehrenreich felt pressure to portray Han, following Ford’s original performances. “When you are a fan of something... it forces you to be a team player a little bit more, because then there is something bigger than you. I felt like I was part of a family immediately,” Glover added. (Lucasfilm/20th Century Fox) Billy Dee Williams and Harrison Ford appear in "Star Wars: Episode V - The Empire Strikes Back," in 1980. These days, no one else seems to be having a moment in the spotlight quite like Glover -- thanks to his acclaimed series on FX, “Atlanta,” and his song and music video “This Is America” which he released under his musical alias Childish Gambino. Yet for Glover, it’s important to stay above the noise. “We forget, like, you actually live those moments. Those moments are lived. Like, they’re not, they’re not thought about. They’re not processed. They are lived, and, like, you’ll miss the best parts of life,” he said. Ehrenreich is relieved the movie will finally be out in theaters this week. "We’re literally working ... under a secrecy cloak," he said. "I mean if we’re on set and we’re shooting, we have to go use the bathroom, we have to put a cloak on so no one sees the costume, you're doing that for two years, and so just to kind of say, 'Here it is,' and present it to everybody, feels great." He even managed to get some time with the creator of the characters that made this all possible and learned about how the inclusiveness of entertainment and films like, “Solo: A Star Wars Story,” can matter.